The Americana Kitchen Island and Two Stools have pastoral design elements, strong lines, recessed panel doors and a shaped top. A cherry finish over solid hardwood and veneers lends a modern twist. Two storage doors equipped with two adjustable shelves, two storage drawers, and two adjustable shelves on each side provide storage. The drop leaf can be extended to allow extra prep space! Depth measures 36 inches when extended. Bar Stool features include contoured seat and straight styled legs. Seat height measures 24 inches. Set includes Kitchen Island and two stools. Finish and measurements may vary slightly. Assembly required. Kitchen Island Size: 48x26x36. Stool Size: 18x22.5x40.25. Home Styles Kitchen Island is constructed of solid hardwoods and engineered wood with a rich White finish. This island also has a distressed Oak finished top for an aged look. Features include convenient drop leaf that rises to provide dining / serving space, antique nickel hardware, easy glide storage drawer, adjustable shelves inside, and open storage on each end with an adjustable shelf. Colonial Classic Kitchen Island w/ Granite Top The embodiment of elegance, the Colonial Classics Collection by Home Styles provides a sophisticated retreat. Creating the kitchen of your dreams with beautiful craftsmanship such as poplar solids and cherry veneers, impressive picture frame moldings, and turned bun feet. Physically distressed using techniques such as worm holes and season splits adding further interest and character to this collection. 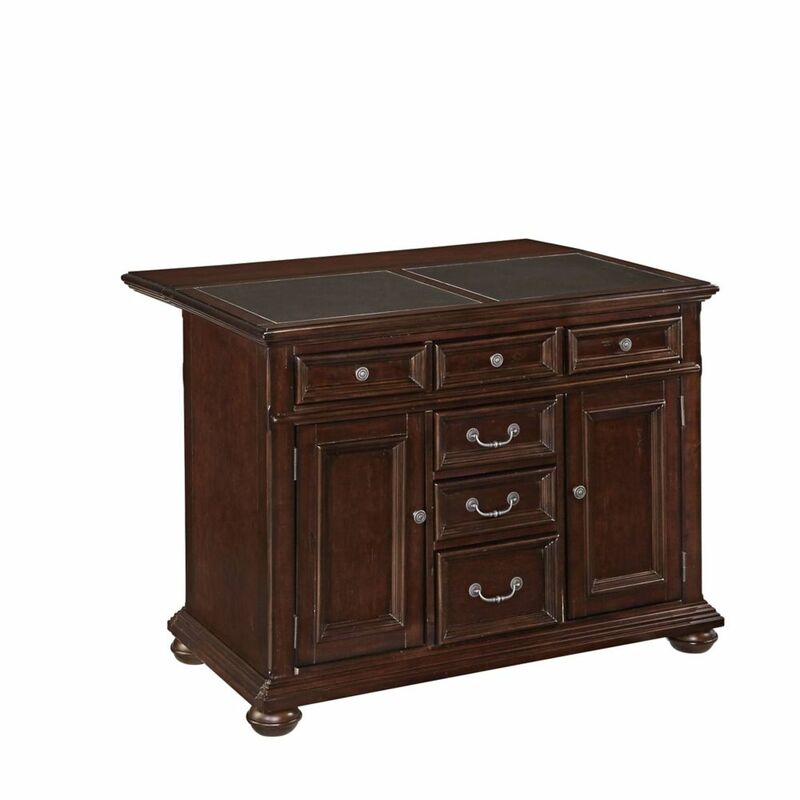 Accessorized with antique pewter finished hardware and a cultured dark cherry finish. The Kitchen Island features a split top with .75 inch black galaxy granite, six storage drawers with side-mounted metal guides, two cabinet storage doors with adjustable shelves, and drop leaf breakfast bar. Breakfast bar extended top depth measures 37 inches. Finish and measurements may vary slightly. Assembly required. Size: 48w 25d 36h.